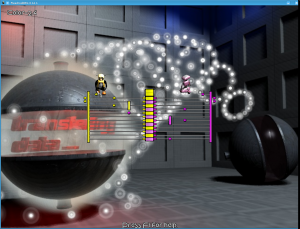 FreeDroid is an open-world role playing game in which the player controls a penguin-like, robot-like character in an effort to save the human world from an uprising of evil robots. That is the dry technicalities of the situation, a role playing game in which we are the world’s last hope. That general concept may not sound particularly unique, but the implementation of the game is. In FreeDroid we pilot a sort of cyborg penguin that is intelligent and has the ability to communicate with both humans and their uprising robot enemies. The player can talk the people, wear armour, use tools and go on quests. We can also interact with computer terminals and enemy robots, sometimes hacking into their electronic brains and reprogramming the enemies to serve our purposes. The hacking into enemy bot brains is actually a large part of the game and is generally the most effective form of “combat” as capturing an enemy and forcing it to fight for our side is more productive than simply destroying it. Plus, remotely hacking into an enemy bot reduces our risk of taking damage, as we usually do in melee combat. To be honest, I have not played all the way through FreeDroid and I feel any general description would not do the game justice, so I would like to share of some of initial impressions I had as I played through the game. First off, I want to say that FreeDroid come with a great tutorial level. Role playing games are often complex in nature and all of them should include a tutorial. FreeDroid has a great tutorial level in which a human character walks us through all aspects of the game. We begin with something as simple as walking around the map, advance into wearing and repairing equipment, fighting enemy robots and using ranged weapons. We are shown how to apply gained skill points, keep track of quests and there is a brief explanation on hacking into enemy bots. We also gain a little back story on the world, which is a classic tale of uprising bots and the uncertain fate of humanity. The tutorial was a breeze and very helpful. Then I started out on the game’s quest and it starts off much the same way. We begin by getting some equipment and a brief rundown of current events. From there we can pretty much go anywhere. I wandered around the initial complex for a bit, didn’t find anything interesting and ventured outside. Soon I ran into a bot and quickly defeated it. Feeling confident, I continued down the road until I ran into a group of four bots…. and was quickly destroyed. The gentle hand-handing phase was officially over. After a little trial-and-error I began to learn which bots I could take in a fight, how many I could fight and, with a bit more trial-and-many-errors I got used to the hacking aspect of the game which allowed me to capture enemy bots. Soon I had a small bot army following me around, laying waste to my enemies. I was starting to feel confident again, powerful and more than a little nerdy with all the bot hacking and open source references flying around. It was probably an hour into the game before I started meeting more humans, some of which could teach me how to harvest parts from defeated enemy bots, some who offered to improve my hacking skills, some who offered me quests. These humans appear to be fairly sparse and this meant I spent a good deal of time wandering around, just getting accustomed to the open world and killing bots. One aspect of the game which is either great or annoying, depending on one’s point of view, is that the adventure is very open-ended. We can go just about anywhere and there is very little guidance from the game. We can pick a direction and simply walk, building a bot army as we travel through the open country side. We may be asked to perform a quest here or there, but generally the game seems to assume we will be fine exploring on our own and do not need to be railroaded into doing anything. We need to be self-motivating. This is very freeing, but it also means I spent a good half hour early on walking around, fighting bots and wondering what I should be doing next. Another characteristic of the game I greatly enjoyed is the humour. 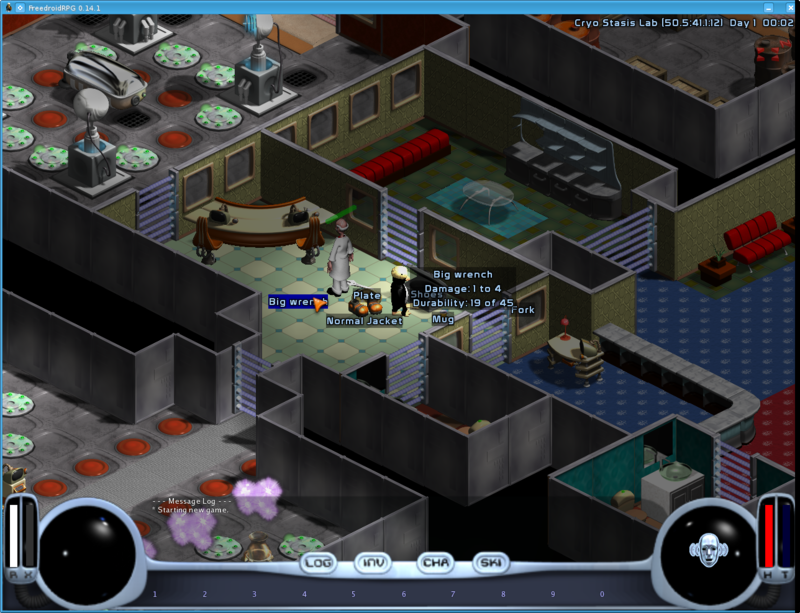 Much of the game makes jokes about operating systems, open source technology, software licenses and programming culture. This may go over the heads of some people, but it will probably tickle the funny bone of most software developers. I certainly enjoyed the thinly veiled references to programming culture. While playing the game I ran into a couple of issues. One was that it appears possible to walk off the edge of the map and crash the game. At least I found wandering into some remote corners of the game world would cause FreeDroid to crash. Another complaint I had was the army of bots we amass seems unwilling to follow the player into certain areas. Most of the time the bots follow along and automatically attack any visible foes, which is great. But the first quest I accepted took me into an underground map and, though my bot army was beside me when I chose to enter the new map, they did not follow me into the new area and I was quickly surrounded by enemies and defeated. I’m not sure why the captured bots did not follow me, but it was an unpleasant surprise. Ultimately, I have to say FreeDroid is a lot of fun. While the lone hero saving the world theme is old, the execution of the theme is wonderfully fresh. The game is full of humour, neat little puzzles and the hacking mini-games add a great new spin to the role playing genre. While I have not finished FreeDroid at the time of writing, I do plan to continue playing as I find the diverse combat system, the challenges and unusual skill set afforded the player all to be great fun.